A Legend in His Time and Ours? Burbank, Calif. February 8, 2005 ? On May 31, Warner Home Video will celebrate the iconic film star James Dean with the release for the first time ever of his complete motion picture legacy. A DVD Gift Set will include East of Eden (available for the first time on DVD), Rebel Without a Cause (new two-disc Special Edition) and Giant (two-disc DVD Special Edition). The DVDs are filled with special features, including new documentaries, commentaries, deleted scenes, Behind the Scenes segments, screen tests and more. 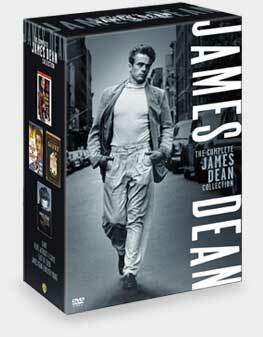 The Complete James Dean Collection will be available for $68.92 SRP. East of Eden, Rebel Without a Cause and Giant will also be available individually for $26.99 SRP/ $19.95 MAP. Orders are due May 3. When James Dean died in a car crash in 1955, he was mourned throughout the world with mass hysteria that had never before been experienced. One of Hollywood?s most spectacular stars, with the briefest of careers, 50 years later he remains an internationally compelling force, an iconic image, and a cult favorite of timeless fascination. Born February 8, 1931 in Marion, Indiana, James Byron Dean moved to Los Angeles with his parents when he was five, but was sent back to Indiana at the age of nine to be raised by an aunt and uncle in a Quaker community when he lost his mother to cancer. He developed a love of performing by giving speeches at the local church on the evils of alcohol and began acting in high school plays. Returning to L.A. after high school, his career began with a few small parts in movies and commercials. Unable to land more substantial movie roles, a frustrated Dean moved to New York to study under Lee Strasberg at the Actors Studio. After rave reviews for his work in a Broadway production of "The Immoralist," he returned to Hollywood. Dean got his big break in 1955 when he was cast in the Elia Kazan production of John Steinbeck's East of Eden. Shortly thereafter came Dean?s first starring role, the one which fixed his image forever in American culture -- that of the brooding red-jacketed teenager Jim Stark in Nicholas Ray's Rebel Without a Cause. It was less than two weeks after he completed filming his third and final feature film, Edna Ferber's Giant, that Dean?s Porsche Spyder collided with another car in Cholame, California on September 30, 1955. In 1956 Dean became the first actor to receive a posthumous Academy Award® nomination when he was nominated for his work in East of Eden. He then received a second Best Actor nomination the following year for Giant. East of Eden (1955) ? Based on John Steinbeck?s novel and directed by Elia Kazan, East of Eden, unavailable on VHS since 1995, is the first of three major films that make up James Dean?s movie legacy. The 24-year old idol-to-be plays Cal, a wayward Salinas Valley youth who vies for the affection of his hardened father (Raymond Massey) with his favored brother Aron (Richard Davalos). Playing off the haunting sensitivity of Julie Harris, Dean?s performance earned one of the film?s four Academy Award nominations. Among the movie?s stellar performers, Jo Van Fleet won the Oscar® for Best Supporting Actress. Rebel Without a Cause (1955) ? In one of the most influential performances in movie history, James Dean plays Jim Stark, the new kid in town whose loneliness, frustration and anger mirrored those of postwar teens ? and still reverberates 50 years later. Natalie Wood (as Jim?s girl Judy) and Sal Mineo (as Jim?s tag along pal Plato) were Academy Award nominees for their achingly true performances. Director Nicholas Ray was also an Oscar nominee for this landmark chosen as one of the all-time Top 100 American Films by the American Film Institute. Three Behind the Cameras Segments from the Warner Bros. Presents TV Series including the ?Drive Safely? public service announcement. Giant (1956) ? Based on Edna Ferber?s best-selling family saga about a Texas family of ranchers and oilmen, Giant stars Elizabeth Taylor, Rock Hudson and Dennis Hopper. In his final film role, Dean stars as wrangler turned oil baron Jett Rink. Directed by the legendary George Stevens, this sprawling epic received ten Academy Award nominations including a Best Actor nod for Dean. Giant held its place as Warner Bros.? top-grossing feature film for more than 20 years following its initial 1956 release. Commentary by filmmaker/Stevens family archivist George Stevens Jr., screenwriter Ivan Moffat and critic Stephen Farber. Extensive production notes, director filmography and introduction by George Stevens Jr. Feature film available in English and French (dubbed in Québécois); subtitles available English, French and Spanish. To coincide with the 50th anniversary of Dean?s death, there are events being planned throughout the year as outlined on the attached schedule. Additionally, James Dean, an in-depth, photographic biography of the star will be published in May by DK Publishing. Written by renowned movie star biographer George Perry, this candid portrait tells the story of the making of an American icon, uncovering new details about the man behind the legend, with in-depth commentary from his closest friends and family, including his cousin and executor of his estate, Marcus Winslow, and best friend and roommate William Bast. Also in commemoration of the anniversary, WHV will re-price James Dean, the dynamic biopic of the meteoric star whose troubled life echoed his gut-grabbing performances in East of Eden, Rebel Without a Cause and Giant; starring James Franco (Spiderman 2). The DVD will sell for $14.98 SRP. With operations in 89 international territories, Warner Home Video, a Warner Bros. Entertainment Company, commands the largest distribution infrastructure in the global video marketplace. Warner Home Video's film library is the largest of any studio, offering top quality new and vintage titles from the repertoires of Warner Bros. Pictures, Turner Entertainment, Castle Rock Entertainment, HBO Home Video and New Line Home Entertainment. Variety to publish a stand-alone edition devoted to the 50th anniversary, headlined ?Cinema?s First Rebel? 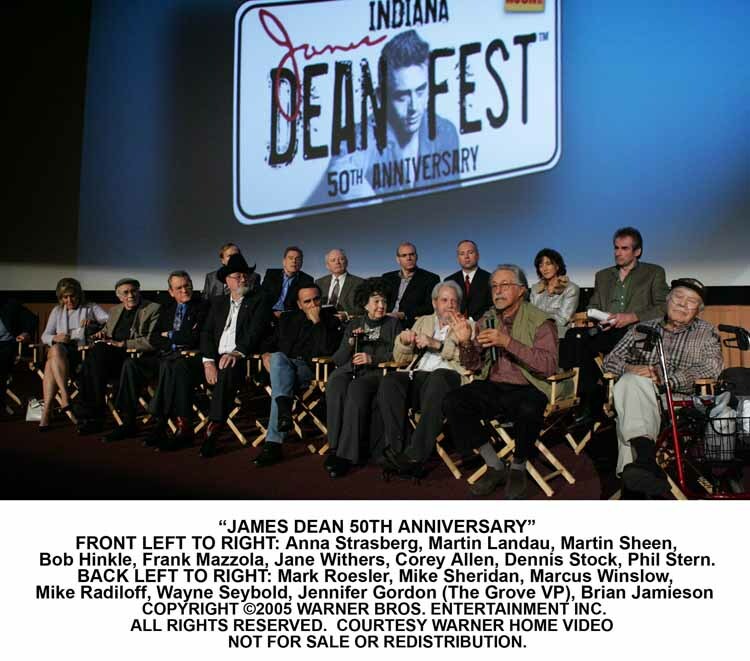 U.S. digital premiere of James Dean: Forever Young and James Dean motion picture legacy, billed as the world?s largest digital ?drive-in?